SHG signal generated in reflection configuration, the nanowires are oriented as indicated on the top illustrations (right panels). Optical second harmonic generation (SHG) is a very sensitive technique to characterize the symmetry and morphology of nanopatterned surfaces. In particular the chirality of a metasurface can be effectively investigated by SHG with high visibility. Among chiral symmetry, the extrinsic or pseudo-chirality is investigated for different potential applications. Extrinsic chiral (meta)surfaces have an achiral structure, yet they can give rise to circular dichroism when the experiment itself becomes chiral. 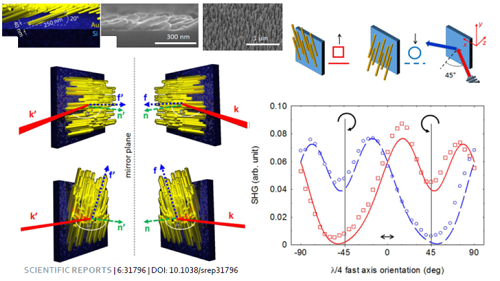 Here we show how SHG measurements can lead to the clear identification of the symmetries that are present in a self-assembled metasurface formed by tilted gold nanowires on a silicon substrate. Optical second harmonic generation (SHG) is a very sensitive technique to characterize the symmetry and morphology of nanopatterned surfaces . It is a background free detection technique that detects magnetic dipole or quadrupole contributions and more importantly a large signal can be produced in macroscopic media lacking inversion symmetry. An important form of symmetry breaking is chirality, the lack of mirror symmetry. The characterisation of surface chirality by SHG experiments has had an enormous impact on the study of chiral molecules that are important for progress in the life-sciences and pharmaceutical industries . Among chiral symmetry, the extrinsic or pseudo-chirality is investigated for different potential applications [3-5]. Extrinsic chiral (meta)surfaces have an achiral structure, yet they can give rise to circular dichroism when the experiment itself becomes chiral. Here we show how SHG measurements can lead to the clear identification of the symmetries that are present in a self-assembled metasurface formed by tilted gold nanowires on a silicon substrate . We demonstrate for the first time how second harmonic generation circular dichroism in such extrinsic/pseudo-chiral materials can be understood in terms of effective nonlinear susceptibility tensor elements that switch sign depending on the orientation of the metasurface. By providing fundamental understanding of the chiroptical interactions in achiral metasurfaces, our work opens up new perspectives for the optimisation of their properties. This work is the result of a fruitful international collaboration between Sapienza Università di Roma (C. Sibilia group), University of Dayton – USA (J.W. Haus, A. Sarangan) and University of Bath – UK (V. K. Valev). T. Verbiest, K. Clays & V. Rodriguez. Second-Order Nonlinear Optical Characterization Techniques. CRC Press, NY (USA) 2009. H. Lee et al. Chiral imaging of collagen by second-harmonic generation circular dichroism. Biomed. Opt. Express 4, 909 (2013). T. Verbiest, M. Kauranen, Y. Van Rompaey & A. Persoons. Optical Activity of Anisotropic Achiral Surfaces. Phys. Rev. Lett. 77, 1456 (1996). E. Plum et al. Metamaterials: Optical Activity without Chirality. Phys. Rev. Lett. 102, 113902 (2009). A. Belardini et al. Circular Dichroism in the Optical Second-Harmonic Emission of Curved Gold Metal Nanowires. Phys. Rev. Lett. 107, 257401 (2011). A. Belardini et al. Chiral light intrinsically couples to extrinsic/pseudo-chiral metasurfaces made of tilted gold nanowires. Sci. Rep. 6, 31796 (2016).